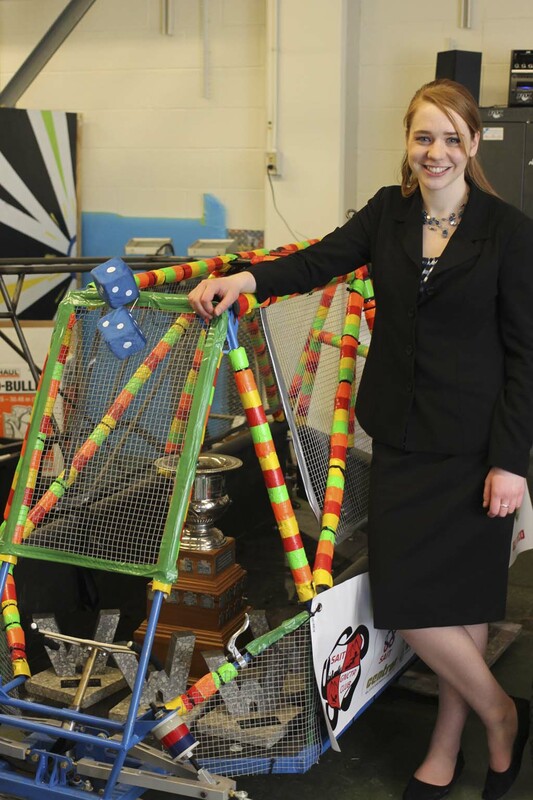 GNCTR president Abigail Watt poses with the winning toboggan. Photo by me. First published in The Weal, March 12, 2018. In late January, SAIT won a unique competition they helped pioneer 44 years ago, winning first place overall at the Great Northern Concrete Toboggan Race (GNCTR) in Waterloo, Ont. The competition involves schools from across the country designing and racing downhill a five-passenger toboggan with a metal frame and concrete running surface that must weigh less than 350 pounds. SAIT won the King of the Hill race portion in a photo finish over the host University of Waterloo. According to the team, the result came after careful analysis of last year’s team, which took first place in the race but finished fifth overall. The team also had to overcome the disadvantages of a two-year school competing against more experienced four-year schools. SAIT, NAIT, the University of Calgary and the University of Alberta founded the GNCTR in 1974, but SAIT had not won it since 1986. Club member and co-VP mechanical Tanner Ellingboe said that with two-year programs, the first-year students have to “start from scratch” when making a toboggan. Despite this handicap, SAIT’s goal nonetheless was a top-three finish. Dean Jim Szautner of the School of Manufacturing and Automation repeatedly pushed the team toward this achievement. “He scared the living daylights out of me for eight months,” said Watt. Emphasis was placed on improving the braking system, which SAIT had struggled with in the past. Ellingboe said that fixing this was their proudest accomplishment in the victory. “The brakes were braking instead of the brakes were broken,” added Szautner. 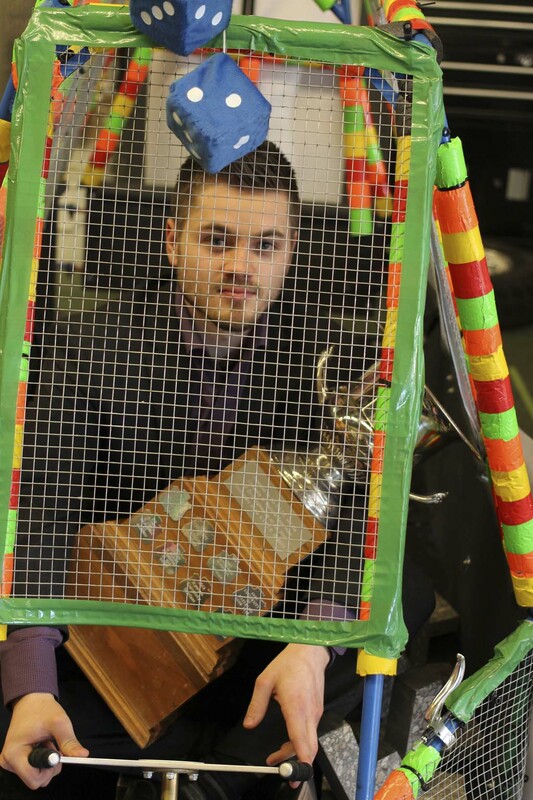 Tanner Ellingboe, co-VP mechanical, poses with the main trophy in the toboggan. The colourfully decorated toboggan represents an Austin Powers theme. Photo by me. Watt said that the project required 12-20 hours of extra work a week. “Sometimes we spent more time in the club than in the classroom,” said Watt. “As engineering technologists, our ultimate goal is to design something that’s going to perform a function and we hope it works the way that it does,” said Ellingboe. Szautner said that concrete toboggan displayed the ingenuity of GNCTR students. “How do you make something made of concrete fly down a mountain?” he said. Watt, meanwhile, had a different perspective on that question. “Who in their right mind would go downhill in a concrete toboggan? Turns out I would,” she said. One of the first (the very first?) 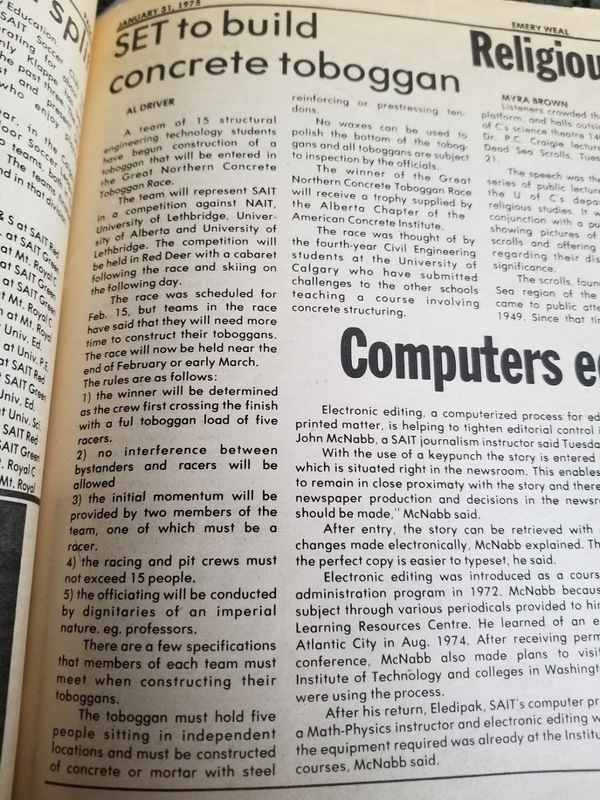 Emery Weal articles on the then-newly established Concrete Toboggan team at SAIT, 1974. Photo by me.